For some, these changes will involve large renovations, and for others,small alterations to the layout of a particular room will do the trick. If you’re thinking about making some changes to your home that your pet will love, consider the following suggestions. 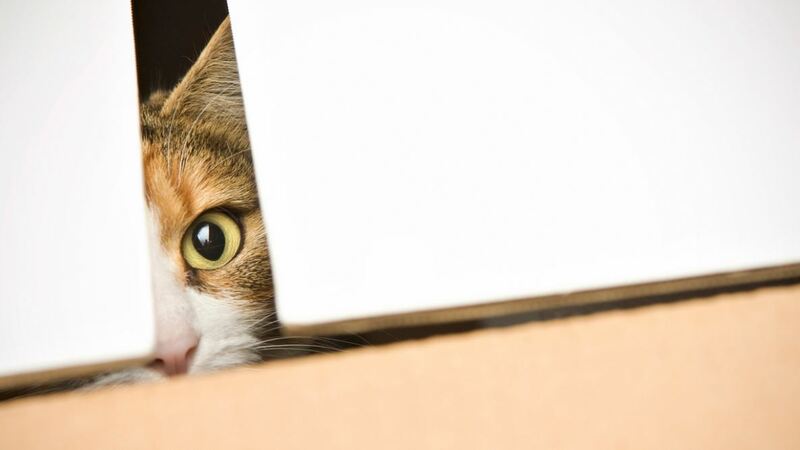 But first, take note: Remodels are messy and can even be dangerous for many animals, so if you’re doing anything bigger than a small addition, be sure to arrange a safe place for your pet to stay during the heavy work, so he or she can stay safe and healthy throughout the construction. You don’t want kitty to be forced to use the litter box outside. At the same time, you also don’t want it smelling up the house. Serious pet parents have created a litter box that’s disguised as a small powder room off their garage. 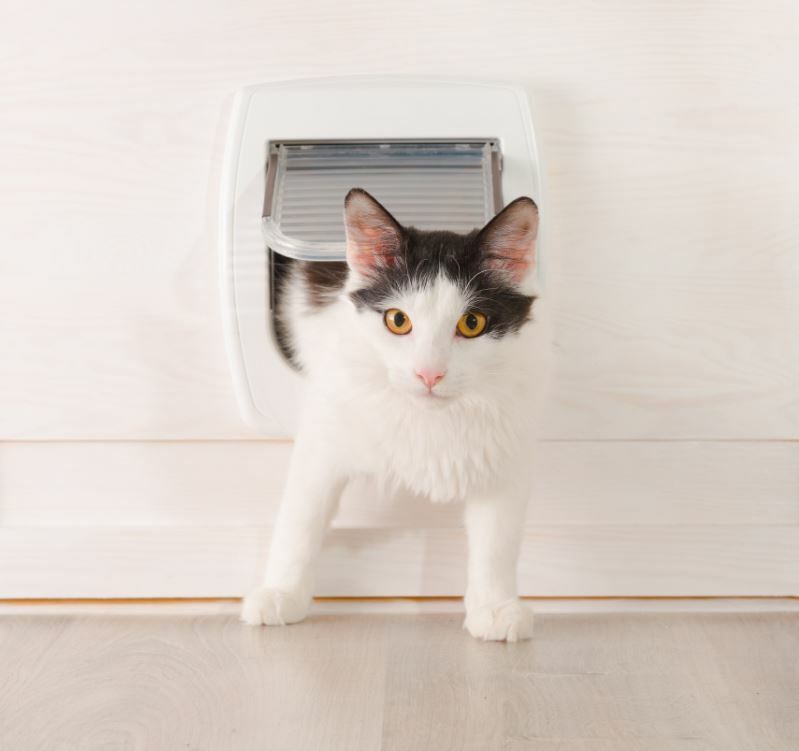 Add a kitty door and use high-quality cat litter to keep the room as nice as possible.If you’re not inclined to go that far and you do use an indoor litter box, consider incorporating a Guardian air PHI air cleaner into your furnace. This uses UV to kill germs and odors throughout your house, and will remove pet odor from the air. If your pet truly is one of the family, he or she might need a place to eat undisturbed. A corner in the kitchen may seem like a good spot, but it’s all too easy to knock over your pets’ water or food bowl, which creates a mess and wastes food. Instead, set up an area in your designated pet room where the food and water bowls will be out of the way. For example, you could cut a small nook in your island and place the bowls on the floor there;or stash them in a low drawer that you can open when it’s time to eat. If you truly love animals, you probably spend time cuddling with your pet on the sofa. And if that’s the case, one consideration might be furniture that can handle the traffic. 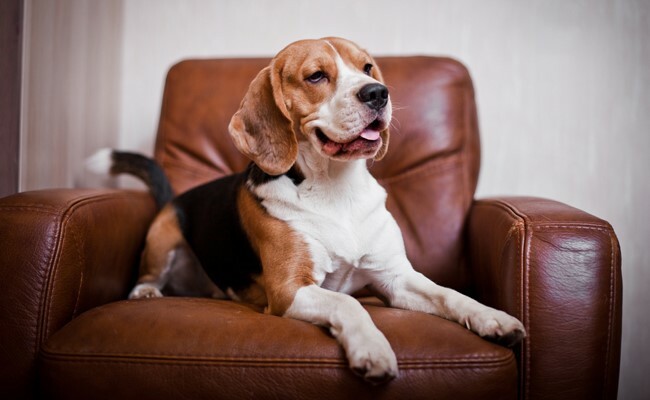 Look for sofas and chairs that have washable slip covers so it’s less of a challenge to keep them clean and free of pet fur. Also, furniture with durable fabrics that claws won’t be able to penetrate. 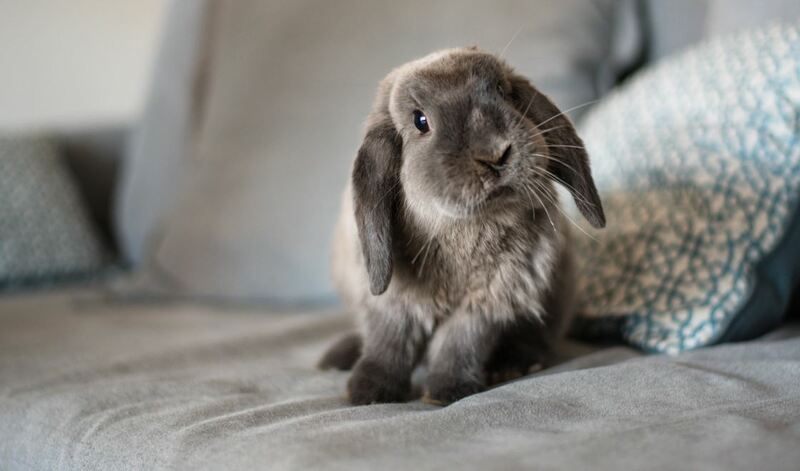 If your beloved companion is a rabbit, you might want furniture with metal legs rather than wood, so your animals won’t use them as gnawing or scratching posts! 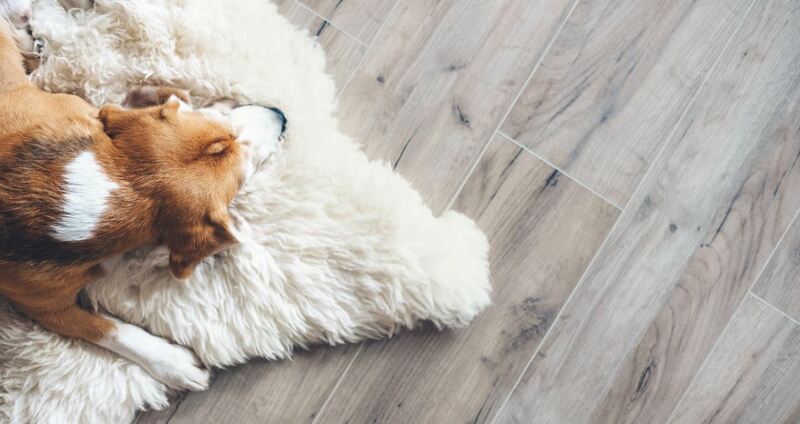 You want your heating and cooling systems to be energy-efficient, but you also want your animals to be comfortable throughout the day and night, even when you are not home. In order to make that happen, take a look at ductless heating. This allows you to keep each room of the house at a specific and separate temperature, which is perfect for your pets, since some may require cooler temperatures than you, and others may prefer a warmer temperature in order to be content. Many family pets will adopt a sleeping area in your home, whether you want them there or not. . They deserve their own space, whether you designate a room just for them or a nook they can call their own. Either way, you can make some significant improvements to that area in order to give them a comfortable resting spot beyond the typical pet bed or scratching post. You might provide an indoor doghouse complete with house structure to give puppy that feeling of his own secure space. Or provide a window sill extension with a cat bed for kitty. This gives them height off the floor, which cats equate with safety. A pet area is a great way to let your pet know how much he or she is loved. Pets have a specific sleeping pattern they observe in order to stay healthy. For many, that can involve sleeping off and on throughout the day. Keeping the lights on all day long can interrupt their sleeping pattern. Turn off any lights you’re not using, and consider adding a light-dimming or timer system to your current rooms so you can have the light on while you need it, but your pets can also get the rest they need. A pet’s kingdom is the floor. Yet carpets are not necessarily the best flooring option for a pet, since they are easily snagged and stained. For easy care, remove carpets and stick with hard-surface flooring. Many pets, especially dogs, actually prefer to rest on hard surfaces during the day because they tend to be cooler to the touch (or paws!). That will also keep your carpets from getting suffused with hair, while at the same time providing a cool place for your pet to relax. Most pets aren’t big fans of bath time. But maybe they wouldn’t mind it so much if they had their very own washroom. For small and medium-sized animals, you can set up a laundry sink with a hose. That way, you don’t have to bend over in a bathtub — or worse, use your freezing cold outside hose to wash your pet. During warmer days, create an outdoor bath area just off your patio. Simply hook a shower head with a hose to your hot water heater and host your pet’s bath time outside. Though your pet would probably be happier if you let it eat out of the kibble bag all day long, that’s very unhealthy. The trick is to provide you with easy access to the pet food while at the same time protecting your critter from overeating. Design a specific place where you can store animal food safely. For example, you could use a trashcan drawer. Perhaps you already have one of these, but if you don’t, there are now energy efficient options. You certainly don’t want your pet to run away, but certain types can allow them to enjoy a measure of independence, and a “doggy door” might be just the thing. These can be added to existing doors or built right in when buying a new door. Good quality ones have a tight seal to keep the cold out when not in use. You could also consider adding pet-sized entrances to your indoor rooms. If you’re pet lives in the laundry room, it won’t be able to open the door for itself if you forget to open it before your leave. 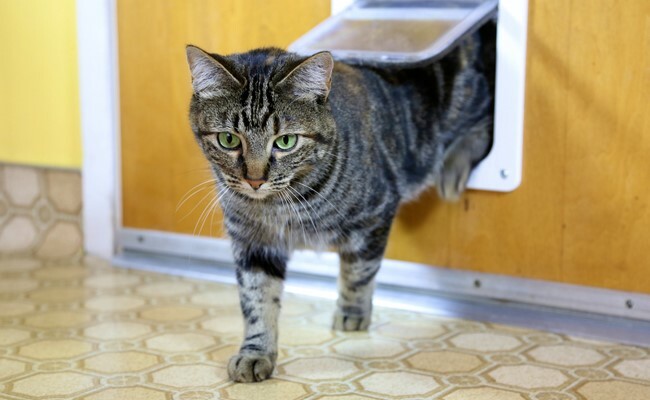 An indoor pet entrance is extremely convenient for any room your pet needs to get access to. You want your pets to be the happiest they can possibly be, and with each of the above remodels, this becomes more possible. But you don’t want to sacrifice energy efficiency in the process. For questions or concerns with regard to how to integrate energy efficiency into your pet-friendly remodel, contact us today! Dander — tiny pieces of skin that get sloughed off in the air — is the main culprit. For individuals with pet allergies or asthma, and even those without, too much dander in the air can worsen symptoms and increase discomfort. Yes, this tip is obvious. But you’d be surprised how consistent baths and brushing can contribute to air quality. Regular dusting and vacuuming of pet hair is also crucial, as it immediately removes the dander from the room and prevents it from being recirculated by your HVAC system. Another easy tip: invest in an air purifier. With options for every budget, including the premier RGF Reme Halo Air Purification System from Washington Energy Services, air purifiers can significantly cut down on air pollutants. Keep those air filters clean. They may seem insignificant, but air filters are the unsung heroes of air purity. Located in your HVAC system, these filters trap particles that would otherwise pollute your indoor air. And remember, this is air that circulates all the time — the air your family is breathing. Want a little assistance in remembering to change your air filter? Sign up for our Automatic Filter Replacement Program. We’ll automatically ship a new filter to your home when it’s time to change it out. You’ll be one step closer to a more pet- and person-friendly home. When it comes to air cleanliness, ducts are key. Unfortunately, pet dander can build up in the ductwork of your home, creating a constantly blowing highway of hair and skin particles. To combat this, we recommend that homeowners with pets get their ducts cleaned yearly. This won’t just help improve airflow and reduce allergens in your home, but will also ensure that less debris fall back into your heating system, prolonging the life of your equipment. Your furry buddy isn’t going anywhere —they’re part of the family. Just make sure you follow these tips to improve the air quality of your home, your family’s comfort, and the longevity of your HVAC system. Perhaps you already have one of these, but if you don’t, there are now energy efficient options. You certainly don’t want your pet to run away, but certain types can allow them to enjoy a measure of independence, and a “doggy door” might be just the thing. These can be added to existing doors or built right in when buying a new door. Good quality ones have a tight seal to keep the cold out when not in use. You could also consider adding pet-sized entrances to your indoor rooms. If you’re pet lives in the laundry room, it won’t be able to open the door for itself if you forget to open it before your leave. An indoor pet entrance is extremely convenient for any room your pet needs to get access to. If your pet truly is one of the family, he or she might need a place to eat undisturbed. A corner in the kitchen may seem like a good spot, but it’s all too easy to knock over your pets’ water or food bowl, which creates a mess and wastes food. Instead, set up an area in your designated pet room where the food and water bowls will be out of the way. For example, you could cut a small nook in your island and place the bowls on the floor there;or stash them in a low drawer that you can open when it’s time to eat. If you truly love animals, you probably spend time cuddling with your pet on the sofa. And if that’s the case, one consideration might be furniture that can handle the traffic. Look for sofas and chairs that have washable slip covers so it’s less of a challenge to keep them clean and free of pet fur. Also, furniture with durable fabrics that claws won’t be able to penetrate. If your beloved companion is a rabbit, you might want furniture with metal legs rather than wood, so your animals won’t use them as gnawing or scratching posts! You want your heating and cooling systems to be energy-efficient, but you also want your animals to be comfortable throughout the day and night, even when you are not home. In order to make that happen, take a look at ductless heating. This allows you to keep each room of the house at a specific and separate temperature, which is perfect for your pets, since some may require cooler temperatures than you, and others may prefer a warmer temperature in order to be content. Many family pets will adopt a sleeping area in your home, whether you want them there or not. . They deserve their own space, whether you designate a room just for them or a nook they can call their own. Either way, you can make some significant improvements to that area in order to give them a comfortable resting spot beyond the typical pet bed or scratching post. You might provide an indoor doghouse complete with house structure to give puppy that feeling of his own secure space. Or provide a window sill extension with a cat bed for kitty. This gives them height off the floor, which cats equate with safety. A pet area is a great way to let your pet know how much he or she is loved. Pets have a specific sleeping pattern they observe in order to stay healthy. For many, that can involve sleeping off and on throughout the day. Keeping the lights on all day long can interrupt their sleeping pattern. Turn off any lights you’re not using, and consider adding a light-dimming or timer system to your current rooms so you can have the light on while you need it, but your pets can also get the rest they need. A pet’s kingdom is the floor. Yet carpets are not necessarily the best flooring option for a pet, since they are easily snagged and stained. For easy care, remove carpets and stick with hard-surface flooring. Many pets, especially dogs, actually prefer to rest on hard surfaces during the day because they tend to be cooler to the touch (or paws!). That will also keep your carpets from getting suffused with hair, while at the same time providing a cool place for your pet to relax. For small and medium-sized animals, you can set up a laundry sink with a hose. That way, you don’t have to bend over in a bathtub — or worse, use your freezing cold outside hose to wash your pet. During warmer days, create an outdoor bath area just off your patio. Simply hook a shower head with a hose to your hot water heater and host your pet’s bath time outside. You don’t want kitty to be forced to use the litter box outside. At the same time, you also don’t want it smelling up the house. Serious pet parents have created a litter box that’s disguised as a small powder room off their garage. Add a kitty door and use high-quality cat litter to keep the room as nice as possible.If you’re not inclined to go that far and you do use an indoor litter box, consider incorporating a Guardian air PHI air cleaner into your furnace. This uses UV to kill germs and odors throughout your house, and will remove pet odor from the air. Go ahead and use your programmable thermostat. The latest thermostats allow you to set different temperatures when you are out, but many people don’t take advantage of those energy savings because they are afraid to make that change when pets are home. Depending on the breed, your pet might not need as much heat or air conditioning on. This is particularly true for air conditioning, in fact your cat will love you for turning it off. Certain breeds such as pugs, bulldogs or sphinx cats will definitely require warmer environments than others, so ask your vet before you make a change. For most, you can still make a bit of a change in the temp, and that’s usually enough to get some savings. Turn off the ceiling fan. Cats and dogs do not have sweat glands like us, so the fan has no cooling effect on them. Get an energy efficient pet door, or caulk your existing one. If you do have a cat or dog door, make sure to air seal it, so you are not creating a source of significant air and heat leakage. Higher quality doors have weather stripping and a door sweep to keep it tightly closed. There are actually some high efficiency doggie doors recommended by EnergyStar. These use some serious technology and claim to maintain an airtight seal every time the dog or cat passes through the flap, “190% better than an average brand”. These can be found online and are higher priced (eg: a small dog door range was between $85 to over $200). If you are considering a new door from Washington Energy, our door installation experts can install any pet door add-on you have on hand. They are installed perfectly to ensure they are air tight and energy efficient. We also sell storm doors that already come with a pet door. Turn the lights off. Having lights on during the day will actually disrupt the pet’s natural sleeping pattern. And they can manage in dim or dark conditions just fine. If you are bothered by not having lights on for them in the evening, put them on a timer to limit electrical usage. Turn off the TV. Your pet is not watching it. And if they need some entertainment, toys are available inexpensively. Treats that are released by a timer from an auto-feed tray can also make their day more interesting. An occasional mouse-toy stuffed with catnip appearing in the cat food dispensing auto feed tray will be a big hit. Fix that leaky faucet. You may think that the dog or cat that loves fresh water is enjoying lapping up some drips, but you are just driving up your water bill. I learned the hard way that when that water hits the tub or sink, it picks up bacteria and if the cat laps it up from there, he or she can get very ill. It is more energy efficient to get a pet fountain if the pet has a love of fresh flowing water. Energy efficient pet practices can be part of an efficient lifestyle and energy saving home. For the best in energy efficient home products, such as windows, people-doors and more, call Washington Energy Services at 800-398-4663.